In 1997 during an education panel in Berlin, then Federal President Roman Herzog stated: "It's all over town. Knowledge is the most important resource in our resource-poor country today. But we can only gain knowledge through education." Two decades later, an issue we are frequently confronted with is the phenomena of false news and "alternative facts" spread and established widely among the population. The contents reach from conspiracy theories to anti-immigrant propaganda and are discussed to having influenced even political decisions such as the withdrawal of the UK from the EU or the 2016 US-presidential elections. Also the successful implementation of the 2030 agenda could be affected if it comes to climate change. Even though there is mostly agreement in the scientific community regarding the anthropogenic impact on climate change, in Germany only one in four people is aware of this scientific consensus (Steentjes, K. et al. 2017), indicating that the lack of comprehension regarding scientific terminology is not the only reason preventing scientific outcomes from reaching and eventually benefitting the society as a whole: Its missing transfer converts science into unused knowledge. Scientific results are often insufficiently communicated to the public or located behind pay-walls, inaccessible for the populace. While misbelieves spread freely and in the digital era even more exponentially the proof of the truth remains a hidden treasure. The difficulty of this transfer gap becomes more and more apparent in internal societal structures e.g. as climate change denial, and also in international dimensions depending on a country's development and its structural and financial means to access and transform science into applicable measures. Since 40 years, the UNEP/UNESCO/BMUB course program seeks to break through these obstacles by enabling policy and decision-makers from emerging and developing countries to gain insights in environment-related state-of-the-art methods and technologies. The program is implemented by the Center for International Postgraduate Studies of Environmental Management (CIPSEM), an institution at TU Dresden and was initiated in 1977 as the GDR's contribution to the United Nations Environment Programme (UNEP). Since then, over 2200 environmental experts from 139 countries have deepened as well as broadened their knowledge during lectures given by facilitators from TU Dresden and other universities, research institutions, enterprises, or municipal-, state-, and federal administrations. A range of excursions is enriching the program with valuable hands-on experiences imparted by specialists from all kinds of environmentally relevant institutions and offering the opportunity for mutual exchange between representatives of science, research, economy, industry and governmental institutions. Finally, the course program is rounded out by interactive items on the agenda such as role plays, work-shops, and action plans and by the preparation and presentation of a final paper supervised by the specialists affiliated to the course program. In doing so, the course program takes not only its allocated role of a teacher in environmental matters but also the role of a mediator between various players in the game of environmental management. 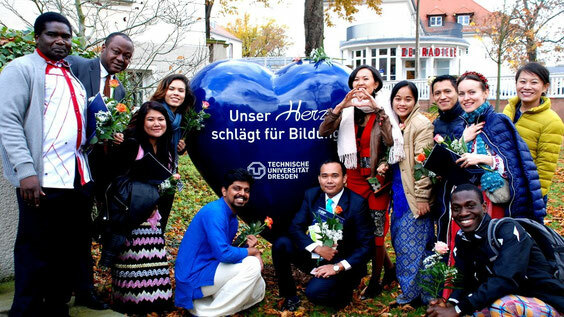 As mentioned, these can be representatives of diverging work fields like ministries, universities or NGOs, but it goes far beyond: in each course 21 participants quite often from 21 different countries join up, and study not only together, but also discover their new and initially unfamiliar environment in Germany together; they share not only their professional experiences with each other, but also their individual cultural heritages, their cooking recipes and their traditional dances. They improve not only their expertise but also their capability to comprehend opposite opinions and to empathize with people with partially entirely different views of the world. Comprehension and empathy, two highly needed key competencies for effective communication, also and especially for the communication of science. To assess the effectiveness of the program's knowledge transfer, CIPSEM is annually conducting a quantitative and qualitative online survey addressing the alumni of past courses. The quantitative part of the study inquires after the alumni's evaluation regarding the contents and the beneficial impacts on their careers. Excerpts of the results are available on the official homepage https://tu-dresden.de/bu/umwelt/cipsem/alumni/alumni-survey. In the qualitative part, alumni are asked to depict their achievements by means of concrete examples. The answers comprise career advancements, the application of newly gained knowledge, active networking, the development and implementation of innovations, and the taking over of roles as multipliers in terms of capacity building. More specifically, the participants design resource management plans, develop green city-programs, and formulate policy guidelines; they pass their knowledge on to colleagues by means of in-house trainings, teach students at universities, publish articles in scientific journals, periodicals, local newspapers, and at conferences, and provide trainings and technical support for rural communities on sustainable farming and livelihood development; they ensure the implementation of eco-labels and of environmental management standards, improve urban planning concepts, and develop financial instruments for eco-sustainable construction of houses for low-income families; they initiate the reduction of plastic bags and cutlery, raise environmental awareness among their colleagues and the population, and eventually let the knowledge leak drop by drop to sites where it is most needed. Even though the alumni also report obstacles in the implementation process - with lack of funding, resources, and political will named most frequently - the enthusiasm in their success stories presages the positive impact of the program and substantiates the relevance of environmental education for a sustainable future. Though the program is constantly adjusted and updated, there is also untapped potential to further increase its range and impact. With the use of current media such as social networks or blogs , the leveling up to knowledge 2.0 has been initiated and opens up new possibilities such as e.g. an online expert database which could provide the opportunity to offer and search for online-specialist consultation and cooperation among former participants. Furthermore additional online courses could contribute to an increased dissemination of knowledge and expertise. Steentjes, K., et al. (2017). European Perceptions of Climate Change: Topline findings of a survey conducted in four European countries in 2016. Cardiff: Cardiff University.